I've done before and after posts before, but just wanted to document one of the most satisfying little makeovers I've completed yet. It seriously took me 10 minutes, and it is bringing me immense joy. 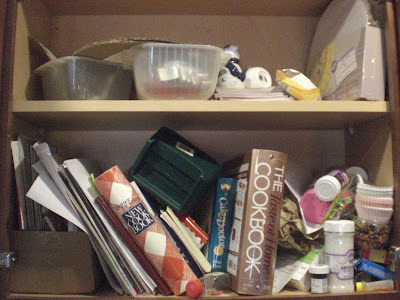 That first picture is embarrassing, but I let this cupboard over my stove get a little out of hand (okay, a lot.) 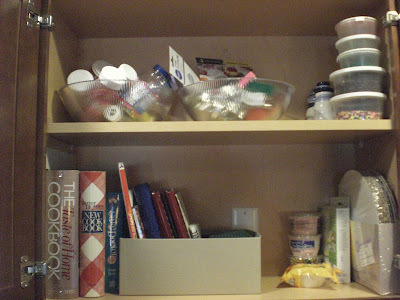 It's the cupboard where I keep my recipe books, cake decorating stuff, cupcake and cookie supplies. We just kept stuffing things in there, and finally I couldn't stand it any more. After some purging, re-organizing, and re-purposing it's much much better. I would still like to tweak things a bit but it is a huge improvement, right? I think today, I will find another space to makeover.